Leather Bracelets There are 14 products. 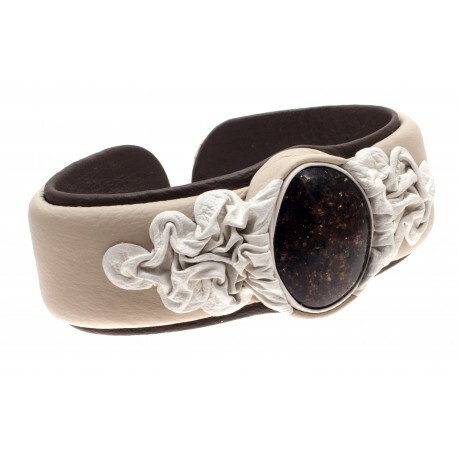 Author's ruffled and flatter, black or brownish colours, real leather bracelets. 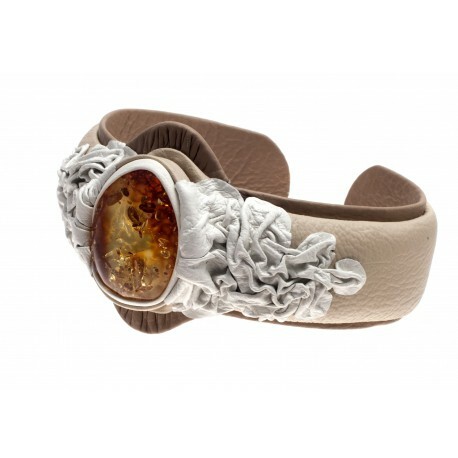 Bracelets decorated with clear or matte, yellow , brown, cognac, cherry and green colours asymmetric pieces of amber. 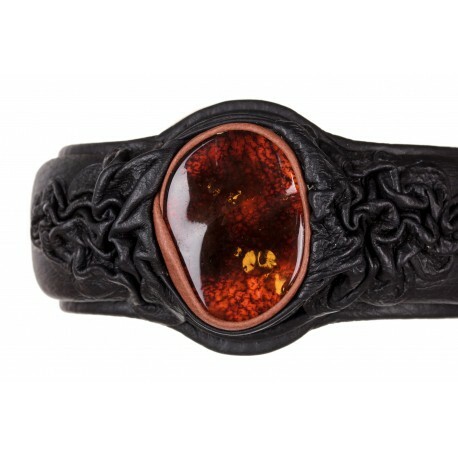 Sparkling and glossy natural ornaments, frozen inside of amber, makes every bracelet unique and incomparable. Best quality hand made jewelry. 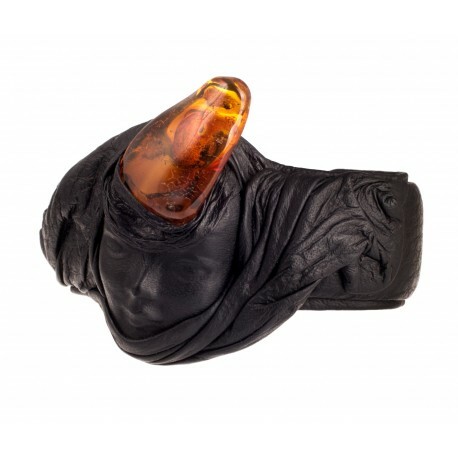 Black leather bracelet "Evening's Miracle"
Amber, with a caramel colour leather rim, is rounded with a composition of a wavy leather which reminds us a new drop of resin on a pine's stem. 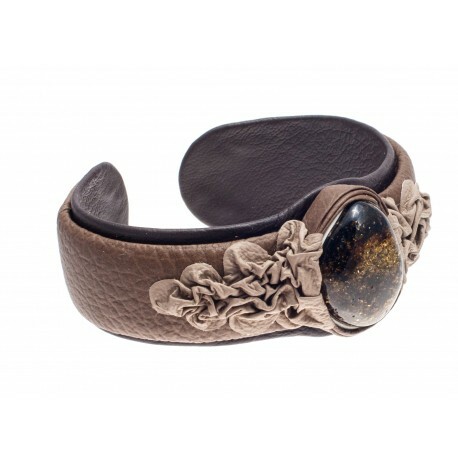 A leather bracelet of adjustable size. 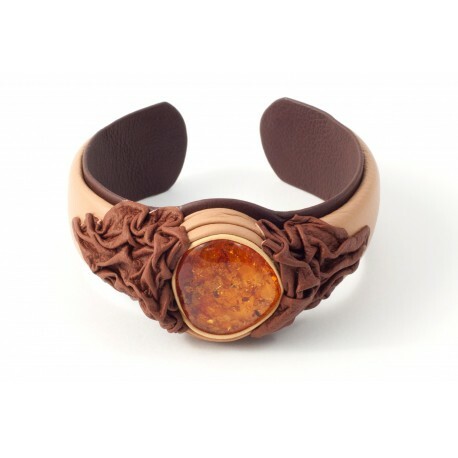 Handmade patterns of leather are contrastively matched with selected amber. An accurate work by an author. 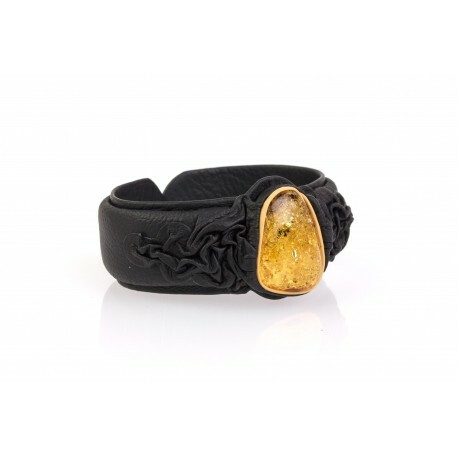 An original, black leather bracelet with gently polished, yellow amber in which small scales are sparkling. A pretty handmade work. Kreminės ir rudos spalvos odinė apyrankė, puošta šokolado spalvos odos ornamentu ir vaiskiu, skysto medaus spalvos gintaru. Vidinė apyrankės pusė dengta rudos spalvos oda. Tamsiai ir šviesiai rudos spalvos odinė apyrankė su glotniai nupoliruotu, iškiliu, žaliu gintaru, kuriame matomos žemės bei augalų priemaišos, tarsi miško samanų paklotė. Apyrankė dekoruota balintos kavos spalvos, rauktos odos ornamentais. 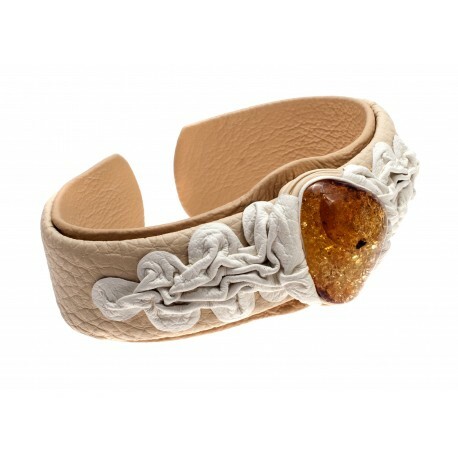 Bleached coffee bracelet with smooth polished, prominent, transparent yellow and cognac shade of amber that shines every time you catch the sunlight. 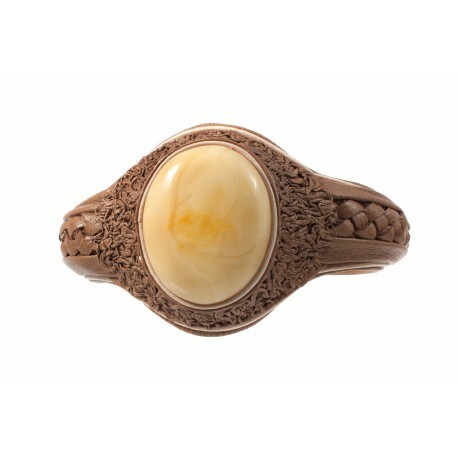 The bracelet is decorated with white, wrinkled skin ornaments. Balintos kavos spalvos odos apyrankė su glotniai nupoliruotu, iškiliu, skaidriu geltono bei konjakinio atspalvio gintaru, kuris sužiba kiekvienąkart pagavęs saulės šviesą. Apyrankė dekoruota baltos, rauktos odos ornamentais. Originali, juodos spalvos, rauktos odos apyrankė su glotniai nupoliruotu, geltonu gintaru, kuriame žaižaruoja maži žvyneliai. Dailus rankų darbo dirbinys. 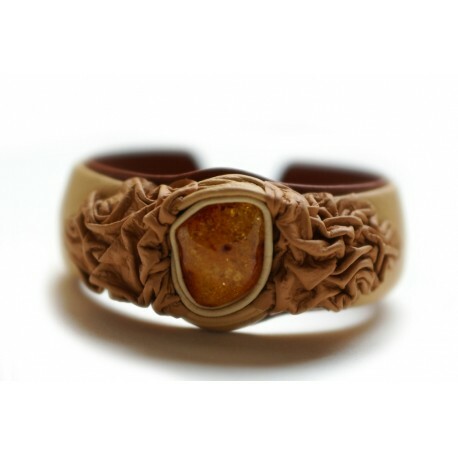 Author's, light brown color leather bracelet with prominent light yellow color amber. 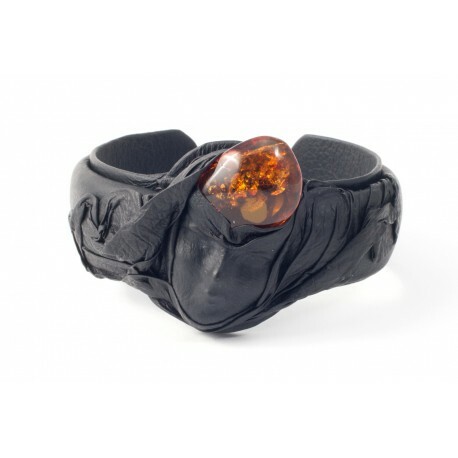 Black leather bracelet with cognac colored amber. In the leather there is an image of a woman wearing a scarf, formed. 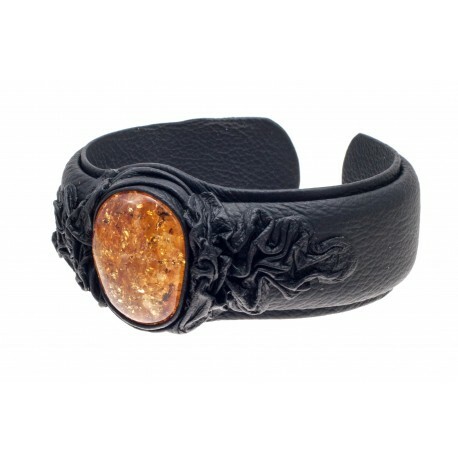 A bleached coffee, gloom leather bracelet with transparent, cognac-colored amber surrounded by a white leather strip. 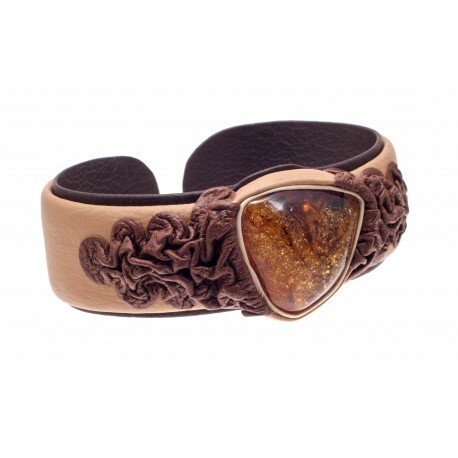 Creamy colour adjustable size bracelet decorated with brown leather ornament and transparent, cognac-coloured amber. 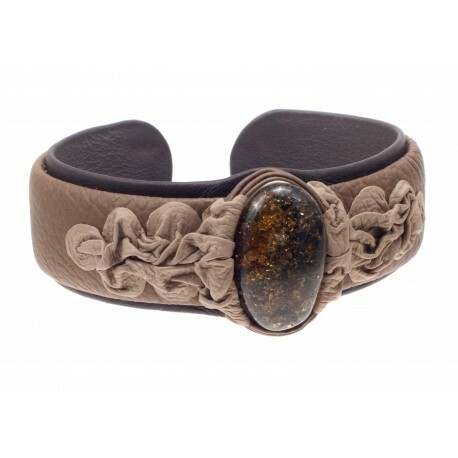 The inner side of the bracelet is coated with brown-coloured leather.